This is from Mr. Pham Hung Manh, Managing Director of ECOPRO Co., Ltd, the company that DTK Consulting had used for website construction. We, a Pharmaceutical Group, have learnt about DTK Consulting Co., Ltd through other colleagues. We have noticed that DTK Consulting maintains professional activities. This is reflected very clearly in the systematic way of working of the management and HR Service Unit of the Company. 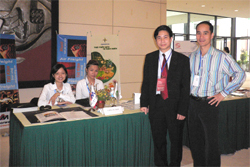 The first recruitment was done in 2006 for Hai Phong Branch of T&M Forwarding Ltd. On photo: DTK Consulting Director and Mr Nguyen Viet Yen (right), Hanoi Branch Director of T&M Forwarding in front of T&M Forwarding’s booth on Vietnam HR Day 2009 (held at National Convention Centre, Hanoi 31 October 2009). - The information sharing is in a friendly atmosphere but principles are respected. Objectivity is maintained to help achieving the right assessment. - Prompt way of working, systematic and having deep professional knowledge. - Bringing candidates a shared feeling and care. When working with DTK Consulting’s Director, the candidate does not feel any pressure and so s/he can gain more confidence and relax, to easily express one’s capacities. 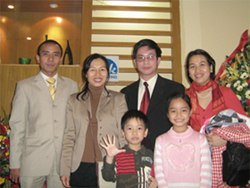 Ms. Nguyen Thi Hai Ha, candidate code number 59, was then working in Hai Phong. From a candidate to a post at T&M Forwarding Co., Ltd, she has become a blog friend of DTK Consulting’s Director. Below is the sharing of Ms Hai Ha, sent to DTK Consulting’s Director when congratulating on the Company's second anniversary, two years later. The picture is from her profile, taken from DTK Consulting’s database. Currently, Ms Hai Ha is working at General Statistics Office (GSO) in Hanoi. Logos of some printed, picture and on-line newspaper, who have reported about DTK Consulting’s activities. Since December 2006, DTK Consulting and the company director have carried out many professional, cooperation and community activities, which have been reported or delivered, on the media. This article presents a summary of DTK Consulting’s activities on diversified fields, which media of various categories had recorded. 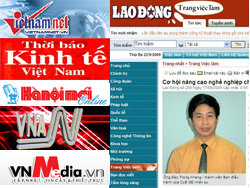 Please note that most articles written by the local media are in Vietnamese. Many people are very much impressed right when visiting the homepage, with photo and "greeting from the company director", that arouse such a friendly sentiment ! It is not a surprise when knowing that Mr. Dao Trong Khang has established his own business named DTK Consulting Co., Ltd.